It was an interesting week last week! More DIY at the studio. ADT Alarm fitted and a visit from the talented guys at Platige Image It was an honor to welcome them to the Capture Studio. I got to meet Tomek Baginski, Jaroslaw Sawko and one of their talented lead artists Grzegorz ( Nes ) Kukus. Platige Image have a wealth of experience and a show case of amazing short films and advertising experience. A really fantastic company, with a large talent pool of artists. 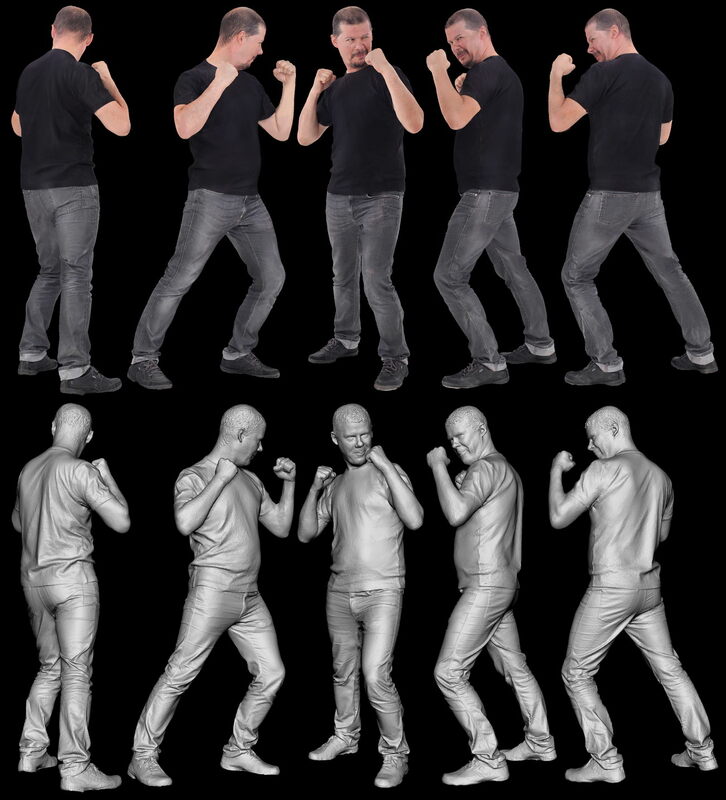 It was a pleasure to meet them and they kindly gave me permission to show some of the quick test scans we did at the studio so they could evaluate the Single Shot 3D Body Scanning system, and to think of ways to integrate the pipeline into their own studio back in Poland as well as replicating a system there. Cool guys and thanks Tomek for allowing me to post these! I'm not entirely sure I can tell, but it seems like these shots are clearer than your shots with Joceline(around the face, mostly). Is that so? If so, was that due to the additional cameras? It all depends how the capture volume is arranged A. These were on the spot quick captures, non of the cameras were specifically aligned for height and pose, which helps. They were also set up for a larger capture volume but this can easily be overcome by processing in Ultra High. You just need the PC power, over 36GB! for 70x 18MP images. 2) How much time did it take to compute one 3D scan ? 3) How many polygons do you get per scan, , what format and what size is the file you save ? 4) How do you manage with the UVs ? 5) Do you still have to fix the mesh (sculpting) , or is it coming perfectly in a single shot ? Hi Tom, Many thanks. Too quickly answer your questions. 3) 1-2 Million is average for High setting. 4-5 Million for Ultra High any more is a waste. 4) I atlas at first to test, then re-mesh cleaned mesh in ZBrush, Unwrap and re-bake in Agisoft. 5) Not so much now, a little re-sculpting and noise removal but because of new masking the results are pretty good. 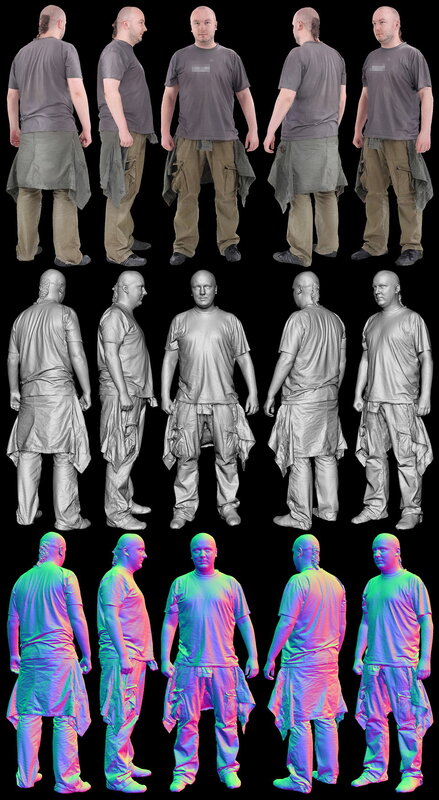 Great job and Great body scanner. 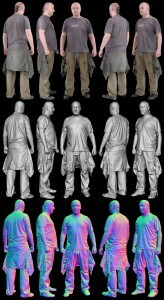 I try to using Noomeo 3D scanner and Creaform handyscan it take alot of time on scan and do data. 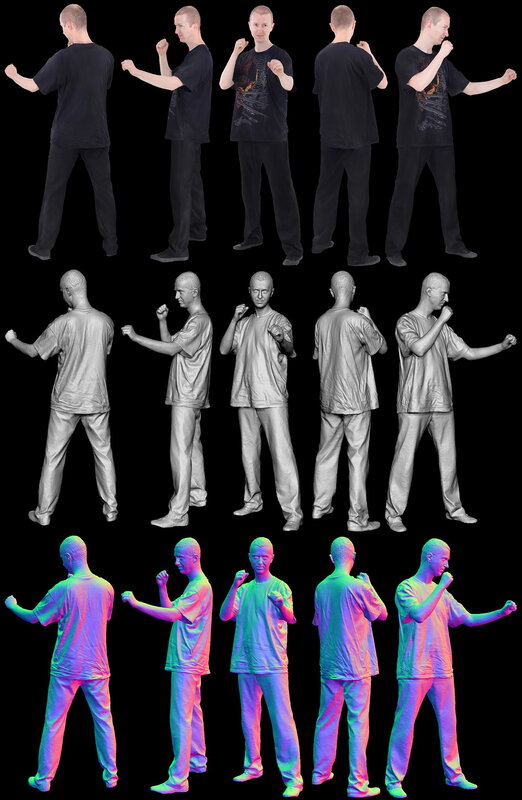 I looking for this kind of custom made high resolution 3D body scan for sculpturing job. Hi Lee, Congratulations for your work. Excuse my question but the answer in Forum of Agisoft are very complex for me. Thanks. You will need Agisoft Pro. If you have a standard license I would suggest reply here http://www.agisoft.ru/forum/index.php?topic=592.msg2646#msg2646 with a +1. Request scale and orientation functionality. At the moment the only way is by Python Script for orientation change and markers for scale. tnx Lee. 3dmax is most friendly tool to modificate the orientation. tnx for the info. Really great scans! I would like to know which version of agisoft you use. The standard or pro ? If you use the pro version can you explain why please? thanks. Thanks Jocelyn, Pro version. Because you can do advanced scripting, great for batch processes. Things like scaling and re-orientating content to 0,0,0. also things like copy bounding box across many chunks. There is 4D processing also, but most users find Standard quite satisfactory. Alos which lens do you use on you 70 dslr? I use the cheap 50mm. They are quite incredible quality for the price. Very impressive. Would a wider angle lens allow you to reduce the number of cameras needed without sacrificing quality? Thanks. No, I wouldn't think so. Thank you so much for your answer. Lastly I would like to know how you shopped for your canon t3i cameras. Did you order all 74 cameras from the same store to get a better price? This is something you need try out. Shop around, find other ways to 'finance' the cameras. IS that the lens you use? I have this lens with a t2i. I just need to buy 73 of them. Yes. I would recommend you learn to walk first before you sprint, there are a great many other things you have to master before you start to try and synchronize 74 Cameras. Also remember technology advances very quickly - was it relevant today, wont be tomorrow. You are right. It goes so fast. 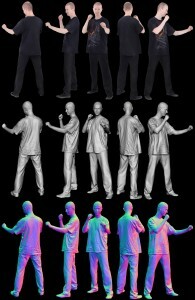 Next week Microsoft may unveil next gen kinect that some wizkid could program to be able to get full body scanning for a few hundreds bucks.